Cluckin’ Easter, don’t miss this epic FREE ice cream! It might not be the sunniest spring weather we’ve ever seen (understatement), but don’t let that stop from you trying these Easter inspired ice creams. Liquid nitrogen experts, Four Winters, has again knocked it out the park with the Choc ‘n Chick, their limited holiday special. 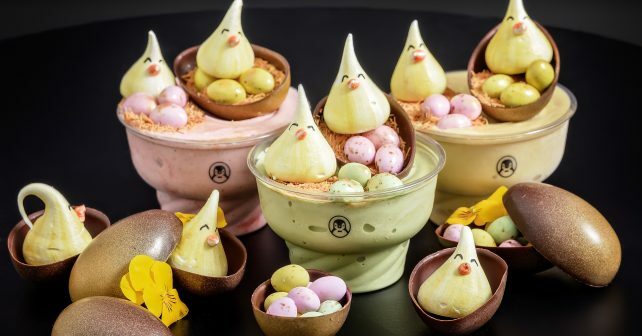 A collaboration with the Meringue Girls it features meringue chicks, speckled mini chocolate eggs and comes with three ice cream bases – strawberry, matcha or passion fruit. Already salivating? Excellent news! For one lunchtime only, they’re giving out FREE servings so if you want to get yer mitts on one just pitch up to their store in Soho.